An opener is not a single unit. 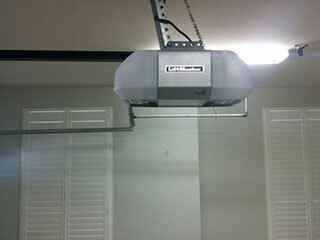 Rather it is a collection of parts that need to work together to lift and lower a heavy garage door smoothly. An opener could be chain drive, belt drive, screw drive, direct drive, or use a jackshaft instead. The overhead motor is connected to the trolley by a part indicated in the name: chain, belt, screw, or placing the motor directly in the trolley. Jackshafts take the motor and move it to the sides instead, attaching to the torsion rods instead of a trolley. Jackshafts can be more dangerous because of the additional cables and pressure necessary to make them work, and they are more typically found on commercial properties. If anything goes wrong with any piece of the garage door opener, you will start seeing problems when you try to open or close your door. A jammed trolley could mean that your door sticks or refuses to move entirely, depending on how severely the trolley is misaligned with the track. The chain, belt, or screw could become worn or break, or the motor could burn out. Sometimes with a broken opener you can still manually open your door, but sometimes you're stuck in or out of the garage. When you need help fast, call our friendly technicians for service. Customer satisfaction is our number one priority when it comes to garage door repairs. Our years of experience in repair issues allow us to accurately diagnose which part is misbehaving so that we can quickly get you the repair or replacement you need. Call Garage Door Repair Andover whenever you're having an issue with your door and we can take care of whatever the problem is.